Substitute solution for a safe evacuation. An emergency staircase is the safest, best and most accepted escape route. 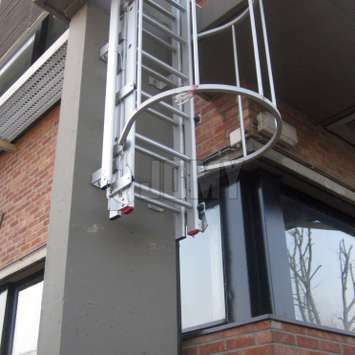 In practice, an escape ladder can be a substitute solution for fire escape when there is a lack of space, a limited budget, the building is aesthetically valuable or multiple escape routes are recommended. 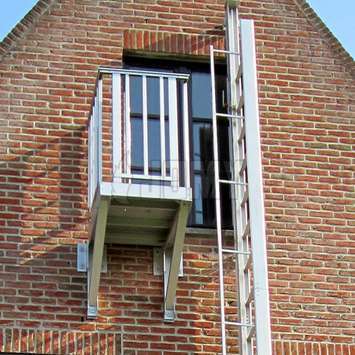 Ladders are a fire escape solution alternative to stairs. Evacuation is a serious matter so why accepting an alternative solution like ladders? Lack of space: An emergency staircase is a bulky solution, and there is not always enough space available. Aesthetics: For historic or aesthetically valuable buildings, planning regulations do not always allow for the placement of an exterior staircase. Layout of compartment: Sometimes, it is better to provide multiple escape routes For example, you may choose to have one fire escape stairway and two additional ladders in other corners of the building. Cost: An escape ladder is much cheaper than a fire escape stairway. Unfortunately, there are situations in which an escape ladder can be economically justified more easily than escape stairs. 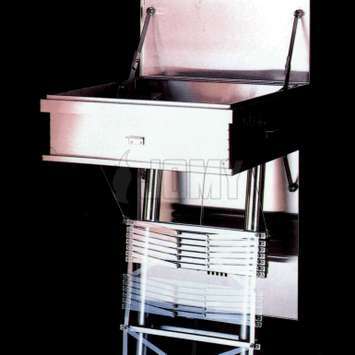 To evacuate a small number of people, a JOMY escape ladder is still a good reliable solutions. It's better to have an escape ladder than no escape route at all! From the press: "Escape ladder saves dozens of lives!" When deciding between an escape ladder or stairs, the following criteria are often used. Limited number of people: Sometimes, the number of persons to be evacuated via ladder is limited to 10. Low building: Sometimes, the number of floors for an escape ladder to be used is limited to 3 or 5. 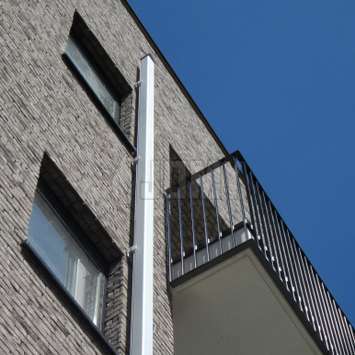 There are many situations where the emergency ladder allows an escape of the upper floors to the flat roof. Individuals with good mobility: Ladders are not recommended for evacuation of children, elderly people, or those with limited mobility. Familiarity of the users: It's an advantage if the users already know the ladder and the evacuation has been practiced. A ladder is easier accepted for a small office than for a small museum with constantly changing visitors. Although fire departments and installers like JOMY recommend stairs for fire escape, ladders make up about 75% of all escape routes in existing buildings. Better an escape ladder than no escape route at all! Cage ladders for more safety? Review of the arguments for and against ladders with a fixed hoop for more safety. Studies have proven that caged ladders cannot provide positive fall-arrest capability, but general requirements are not available. The standards for access and service ladders require a cage from a height of 3m (except for ladders with lifeline). The cage gives a psychological feeling of protection, preventing vertigo. In case of a fire, the cage can be an obstacle. A person in panic may block the ladder. The ladder can't be used with a child or with a back injury. The ladder is difficult to use for firefighters with equipment on their backs. Scientific studies indicate that the cage offers little or no actual protection in a fall. There are several important conclusions drawn by this comprehensive study with simulations, accident analysis, and literature review. There is no general prescription (law, standard) about cages for evacuation ladders. 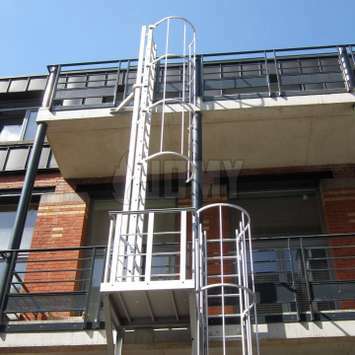 Access ladder extensions, telescopic handrails, horizontal access balconies, upper balconies with rungs or steps to cross roof edges, custom made access landings, etc. Your own design ideas can be integrated into ladder construction. 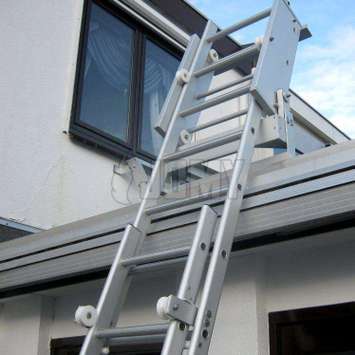 Your preferred JOMY ladder can be constructed for you on request.